Today's pics feature my new jacket I got for the fall and perhaps early winter, if it doesn't get too cold too quickly. I will post a more detailed look with the same jacket on Sunday, so now I'll just go through other details briefly. The morning was cold, it was windy and I was a bit tired, so playing with a lot of colors wasn't something I really felt like. Therefore, this Friday's theme is grey and staying warm. 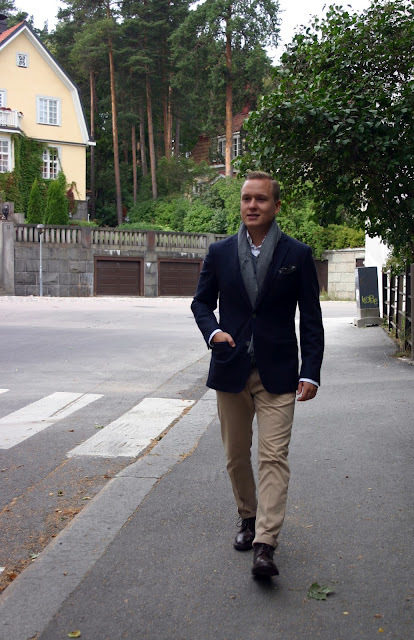 So, I went with light beige chinos from Tommy Hilfiger and a white button-down shirt from PRL. A word of praise has to be given to the chinos, as they are still fantastic and have seen a lot (A LOT) of wear and still remain in very good shape. Now, that's not really such a miraculous feat, but them being Tommy Hilfiger which I generally don't assosiate with super high quality, I think they've done very well. The vest is cotton, and the scarf wool. 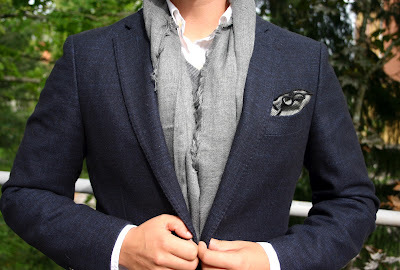 The pocket square is a woolen round pocket square with a houndstooth texture and a dark grey border. Gotta say just looking at the jacket's nice fuzzy texture makes me feel warm. So, have a good weekend everyone and check back soon, the next post is something I like a lot myself.